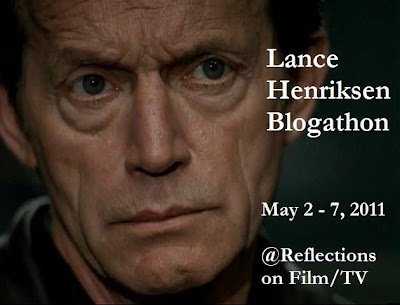 Unless you’ve been on the moon, fans of Lance can’t have failed to notice that last week marked the Lance Henriksen Blogathon, co-hosted by the huge talents that are John Kenneth Muir and Joe Maddrey. It was also, of course, timed to coincide with the release of Lance’s biography, “Not Bad for a Human”. The week-long event was a huge success with a wealth of material celebrating Lance’s long and varied career to date being blogged, and John rounded it all off with a special thankyou on his blog to all the contributors. What we wanted to do here at Back to Frank Black, though, was to highlight the wealth of Millennium-related material that showcased how alive support for the series still is, and point you back to some of the highlights in case you shamefully missed any of them. Some of that material of course came from John and Joe themselves. John selected some memorable character-led scenes for his five favourite Frank Black moments and referenced Frank Black’s “quiet tenderness” as a father in his piece on “The Tao of Lance Henriksen”, whilst Joe recalled the critical reaction to Millennium’s debut in 1996 and asserted how “we need (Frank Black) now more than ever”. Others joined the fray too. Jane Considine wrote about Season One’s “The Well-Worn Lock” and told of how she is “mesmerised by Frank Black”. And an extensive and carefully considered article over at Musings of a Sci-Fi Fanatic reminds us how “Henriksen’s approach is subtle, restrained, complex and vulnerable, the necessities required for the mood and depth of Chris Carter’s Millennium and such an extraordinary human character”. The same blog followed that epic with a reminder of some of the striking visual imagery of Season One. Back to Frank Black’s voice was also in evidence throughout the week. James wrote a personal piece about Lance, reflecting upon his portrayal of Frank as “deeply, tragically human, filled with uncertainty, hope and love”, whilst Troy also talked of his personal friendship with Lance and summed him up as “The Essence of Excellence”. Meanwhile my regular column What the Killer Sees inverted its usual format in order to examine Frank’s transformation in the episode “The Beginning and the End” and Lance's finely nuanced handling of the role to ensure that the audience “continue to want to follow this complex hero on his journey through the dark”. It was a wonderful week and we’re just proud to have been a small part of it. So go, read and enjoy all over again. And, when you're done, go write a letter or two. 4 Responses to "Reflections on the Lance Henriksen Blogathon"
Thanks for this great look back at a really wonderful (though very busy...) week. I've always known how much people appreciate the performances of Lance Henriksen, but I was thrilled to see so many bloggers gazing at his many works in films, TV programming, and even video games. I also want to thank you, and James and Troy, for contributing great pieces about Lance and Millennium, and for supporting the event. I'm honored to make your retrospective. It was great being apart of it all. It was a pleasure. Thank you. On another note, I really enjoy this site and will continue to visit. There is much I wanted to read prior to writing my own article but I really held back for fear of influencing what I wanted to say. Anyway, there were several articles here I plan on spending sometime reading and I'm really looking forward to them now. Thank you. @ John: I can only imagine the amount of work you must have put into the blogathon and, whilst I'm sure it was its own reward given the success of the week and the wealth of fine material, rest assured it was most appreciated. We were more than happy to be along for the ride and join with the host of voices celebrating Lance's varied career to date. @SFF: You're more than welcome, and your article was a great piece on the series, so thanks for taking the time to pen and share it. Great to have you onboard with the campaign too, and we'll do our very best to keep you entertained as well as to continue to seek a return for Frank Black!